Many thanks to Amy @Amy’s Creative Side for continuing to host the Blogger’s Quilt Festival. 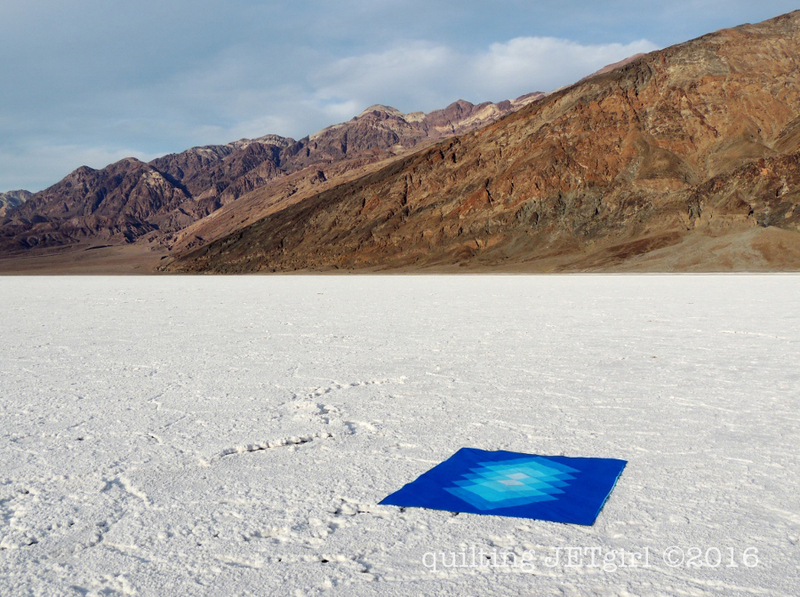 This year, instead of 2 festivals that align with Quilt Market, Amy has offset the festivals from market and moved to hosting an IG Quilt Festival in the spring and the online Blogger’s Quilt Festival in September. I am always so inspired by the quilts that are shared during the festival, so even if you do not link up, I hope you hop over and take a look at the amazing quilts that are being entered this year. The festival requires that we create new blog posts to link up, so many thanks to my patient long term readers for allowing me to get to re-share quilts from this past year of which I am particularly proud. We are allowed to link up two quilts to the various categories, and my second entry to the festival is Sunburst, which I am entering into the Original Design category. Sunburst is probably still my most favorite quilt finish to date. The colors are my absolute favorite, probably because they are derived from an underwater inspiration photograph (I *love* being in, around, and near water). I designed Sunburst as part of the Quilt Design a Day Facebook group in May 2015. The spark / inspiration image was an underwater photograph looking up at a scuba diver who was enveloped by a Sunburst – streaks of light emanating from the sun above the diver. I submitted the quilt pattern for consideration in the 2016 QuiltCon Magazine, and I was thrilled when it was accepted (my first magazine publication)! I was absolutely stunned when it was chosen as the quilt for the cover of the magazine as well. *Note: I believe my photographs of Sunburst capture the true colors of the quilt and that the magazine cover has been altered to make the tones a little less teal and more blue. The piecing of the quilt came together very quickly, and I then spent 4 long days quilting it on my domestic machine. I learned a lot about quilting a larger quilt on my domestic machine as I worked through quilting Sunburst. I learned to start in the center and work my way to the edges and wrote about it in my Crosshatch Quilting Tips. I ripped a lot of stitches to fix areas where my quilting wobbled. I ripped a lot of stitches to fix areas where my stitch length was super irregular. It was not perfect when I was done, but I was pleased with what I was able to accomplish. One of my favorite parts of the quilt is the binding. I spent another 2 days putting the binding on after the the quilting, washing, and blocking. I wanted to continue the sunburst idea across and into the binding, also playing off of the idea of water reflections and how light refracts in water. I think this in process photo really shows how I laid out the strips and planned the binding. I wanted the lightest portion to be centered, so I actually started sewing down the binding in the center of the light portion and worked to an end. 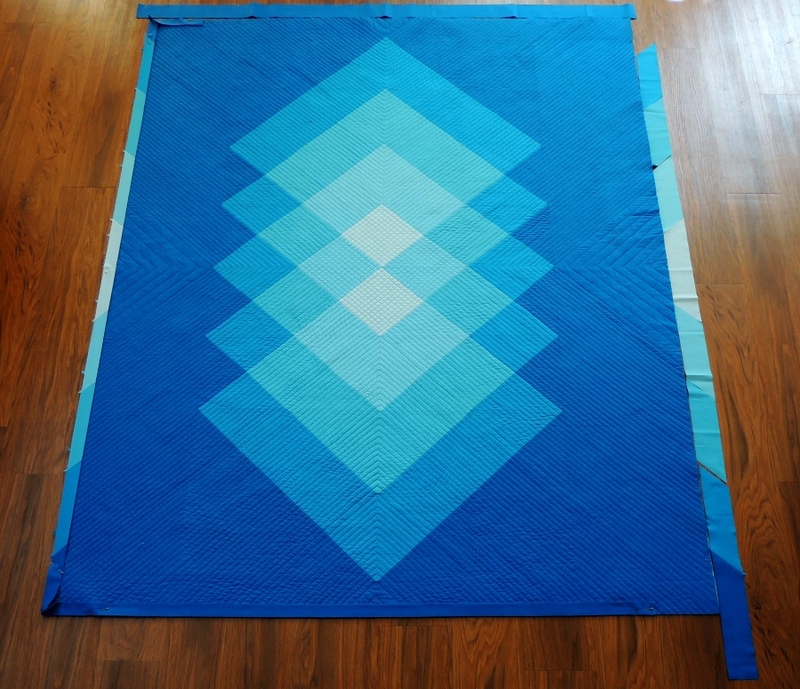 Then I loaded the quilt backwards from how I normally work to start back at the center. I did this for the 2 sides and then had 2 binding joints to make at the top and bottom of the quilt. Sunburst finished at 60-inches wide by 80-inches tall, and she is currently away from home and will be showing at the Modern Quilt Guild Showcase 2016: International Quilts. If you are new to my work, a few of my recent finishes from this year are featured above. I hope you stick around and explore my free Tutorials, and if you have more time, I urge you to peruse some of the Discussions that we occasionally have here as well (be sure to read the comments on each Discussion post!). 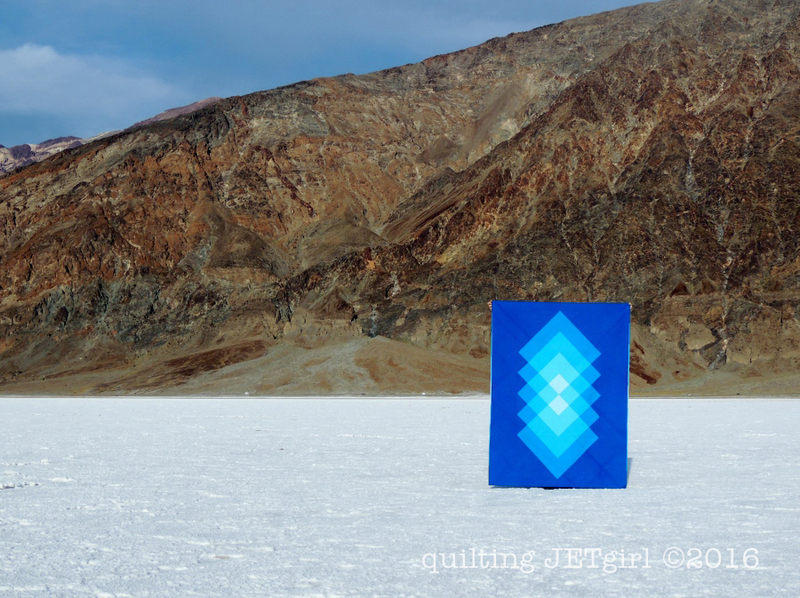 Thank you so much for taking the time to stop by and (re)read about my quilt, Beacon. Sunburst is an amazing quilt. It sparkles with light. Congrats on the front cover. Your quilt is amazing! You go, covergirl! <3 I hope I get to see this one in person someday. It's just luminous! This quilt is another of my favorites of yours, but Beacon is probably at the too. Your mandala mini is another one, and Lucent, as Snowflake Shimmer, and… I like ’em all! It would be difficult to select two from your amazing creations. Another great entry for the BQG! Way to go, covergirl! Stunning; I think this is my favorite of your quilts, and I’m glad for the opportunity to see it again and remember your story. And as always, your photos are beautifully vibrant and crisp, and I just love how you feature your quilts in such fabulous photo settings. Sunburst is probably one of my favorite quilts ever, Yvonne. I love it so much. I love your Sunburst! The magazine cover didn’t look as beautiful!!! I love the “true” colors and want to replicate it!!! Love all the quilts shown. I have always loved this quilt and the setting where you took the picture contrasts with and highlights the design so well. Sunburst is a showstopper! And I like your teals more than I like the blues of the magazine cover too. I love your quilts and Sunburst is definitely one of my favorites. I also really love how you describe the thought processes behind each quilt. As a newer quilter, your descriptions help me to think about different aspects of making quilts beyond just sewing fabric together. Thank you! Oh such a Fantastic Design – the photo you took is absolutely stunning too! I remember being so thrilled for you when Sunburst made the cover Yvonne! (I voted for you too.) It’s strange that they altered the colors. It’s always fun to see whenever you play with transparent effects. I never get tired of seeing this quilt, it’s so beautiful and the design draws you in each time. Such a lovely quilt! The colour differences in the photos are interesting… they’re very different shades. Eureka!! Yvonne can you please tell me the names of these blue fabrics? They are exactly what I’ve been looking for to use with Triangle transparency. Gorgeous! This one is probably my favourite of your too. Looks so vibrant and beautiful against the white background. I still think it is awesome that your quilt is on the cover! I didn’t realize your fabrics were more teal. They sure are pretty! Its like this quilt is glowing! The colors are amazing! It makes me happy to see this one again, you are an amazing designer Yvonne! This has to be one of my favorite quilts. I just don’t get tired of looking at it. It is one of those beauties that I can imagine as a computer desktop background or a photo of the quilt on my wall. And I think your quilting on it is phenomenal. It works perfectly with the piecing. The magazine didn’t do this quilt justice because I love the teal color in you photos. 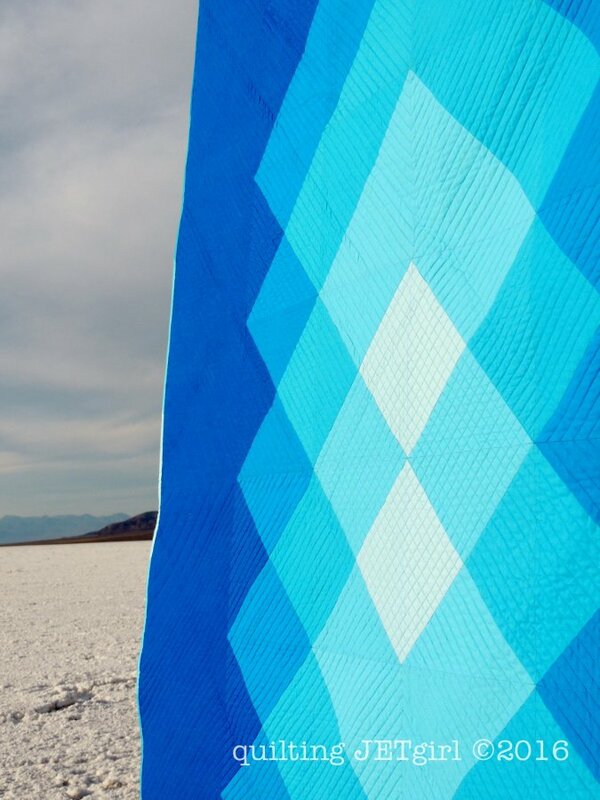 This quilt is so striking in its simplicity. One of my favorites Yvonne! This one is a winner, Yvonne. You got my vote! Wish you all the best in the festival. 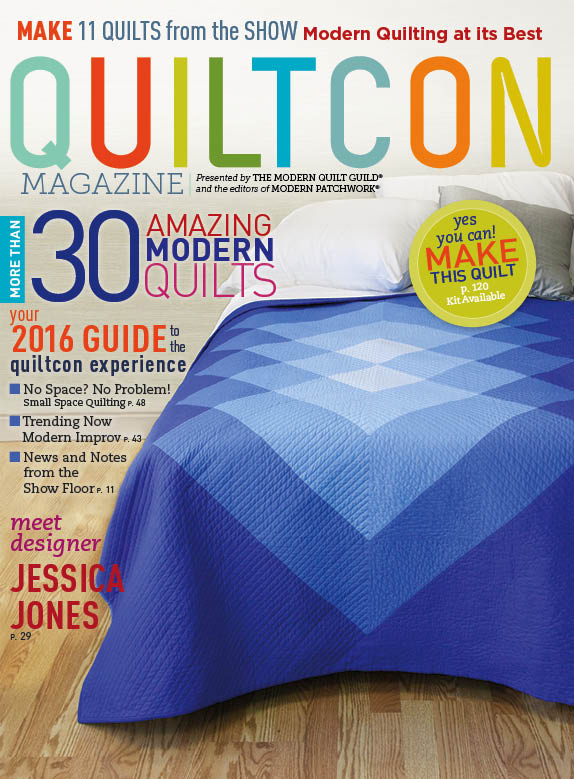 Yvonne, does the QuiltCon magazine have the actual pattern? If not, are you planning to release a pattern?